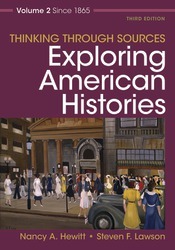 Thinking through Sources for Exploring American Histories is a two-volume primary sources reader that supplements the document projects in the textbook. Each chapter of the reader presents five carefully selected documents that connect to topics in each chapter of Exploring American Histories. New Central Questions at the beginning of each chapter provide a framework and a focus for the documents that follow. Headnotes placed strategically before each document give students just enough context, and Interpret the Evidence and Put It in Context questions at the end of each chapter provide a starting point for classroom discussion or a written assignment. This collection of sources is available both in print and in LaunchPad with innovative auto-graded assessment.